The Journal of Financial and Quantitative Analysis (JFQA) publishes theoretical and empirical research in financial economics. Topics include corporate finance, investments, capital and security markets, and quantitative methods of particular relevance to financial researchers. With a circulation of 3000 libraries, firms, and individuals in 70 nations, the JFQA serves an international community of sophisticated finance scholars—academics and practitioners alike. The JFQA prints less than 10% of the more than 600 unsolicited manuscripts submitted annually. 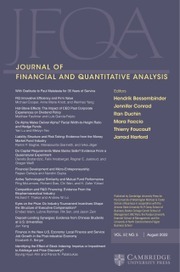 An intensive blind review process and exacting editorial standards contribute to the JFQA’s reputation as a top finance journal. Insider Trading: What Really Protects U.S. Investors? Analyst Promotions within Credit Rating Agencies: Accuracy or Bias?